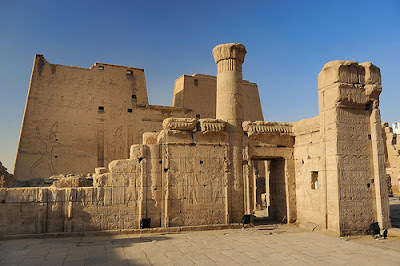 Esna, an important monastic centre in the early Christian era, contains the ruins of the Khnum Temple, the ram-headed god who was believed to have fashioned man on a potter’s wheel from the clay of the Nile. 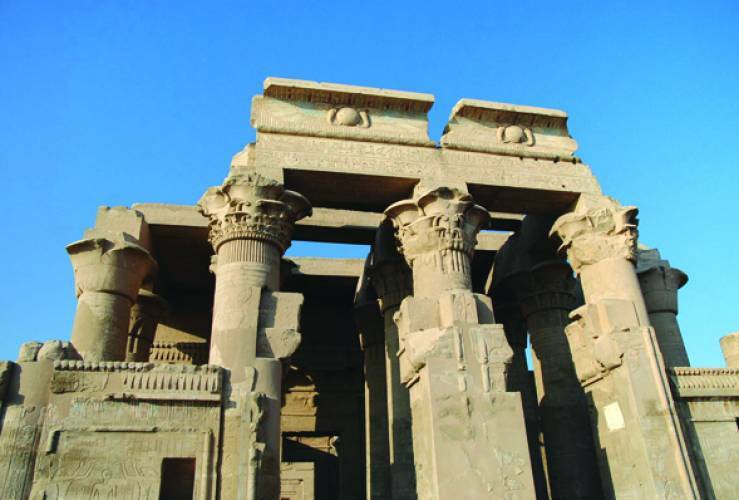 The temple dates to the Ptolemaic period (though it was built on the site of an earlier temple raised by the 18th dynasty pharaoh Thutmose III). Some sections of the Egyptian temple were constructed and adorned by the Romans. The main columned hall contains representations of the Roman Emperors dressed as pharaohs, worshipping Egyptian deities. The cartouches bear the names Marcus Aurelius, Antoninus Pius, Claudius and Decius. One of the most perfectly preserved monuments in Egypt is to be found here in Egyptian Edfu. It is the Temple of Horus, constructed of sandstone. 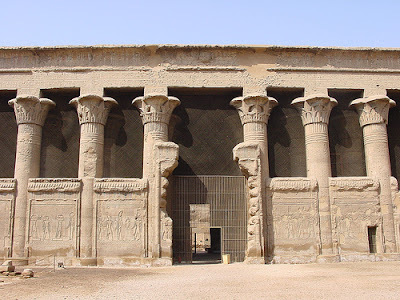 The main temple was begun by Ptolemy III in 239 BC on the site of an earlier shrine. It was enlarged during successive reigns until 57 BC, when it was given a final touch. The history of its construction along with a detailed description of the temple is inscribed on the outer face of the girdle wall. The predominant theme of the reliefs is the pharaoh (Ptolemy Soter II or Ptolemy Alexander) consorting with the Egyptian deities and triumphing over the enemies. Apart from the faces, which were damaged by the early Christians, the murals are perfectly preserved. Ombos or Kom Ombo was a pre-dynastic (before dynasties) settlement. It was only in the Ptolemaic era that it attained prosperity and temples were constructed (on the sites of earlier shrines of which little is now left). The Sobek Temple and Haroeris was built on a uniform plan typical of the Ptolemaic period and, like the Dendera temples, Edfu and Philae, was decorated with reliefs of several Ptolemaic kings and Roman emperors. The murals in low relief dating from the Greek era can easily be distinguished from the Roman, which are in high. The most beautiful reliefs are in the Great Hypostyle Hall where the king (Neos Dionysos) is depicted before Haroeris, whilst being blessed by the lionheaded Selket and the hawk-headed Harsiesis.